Computer, Laptops and other gadgets have become rather a necessary part of everyone’s life. We can’t imagine today’s lifestyle without gadgets. Computers are used in every field including Banking, Business, Education, Entertainment, Marketing, Medical etc. Laptops provide all computer facilities with addition of WiFi, sound, display, battery in a single unit. We can easily carry it anywhere. Laptops are also used in professional work so we need to share data with our companions. While we can share data between two laptop devices with LAN cable and router easily. Sometimes we are not in the state to access LAN network. Thus, in such situation we need to transfer large data, then best possible solution is to connect two laptops using WiFi network. Even connecting device wirelessly is easy and we can move data where we feel comfortable. While we have already explained about transfer data from android to laptop. In the same way we can also connect two laptops using WiFi easily. We just need to make a small adhoc network to share files with others. Laptops have wireless cards therefore, with the helps of laptops we can create an adhoc network without any wireless WiFi router. Even we can use our mobile hotspot to create wireless network between laptops. If you do not know how to configure a wireless network then this post is really for you. Thus, Here we are going to discuss about how to connect two laptops using WiFi. Hence, this is really and best way to create wireless network between two laptop. How To Connect Two Laptops Using WiFi. How To Share Data Among Connected Users. Step 1. Open the control panel and then click on Network and internet option. Then you see the network and sharing option. Open it. Step 2. 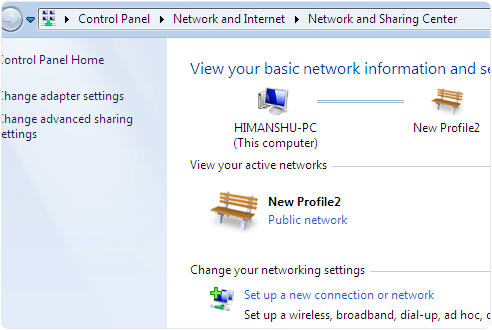 Now you see the Network and sharing Window with many options. Then you have to click on the setup a new connection. Step 3. Now you see a choose connection option Dialog. In the dialog look for set up wireless and adhoc network. Step 4. Now you can see the next window with Network name, security type and security key option. Step 5. 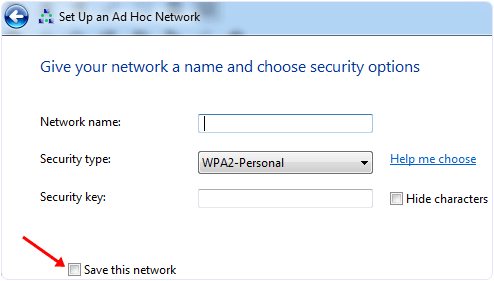 Then you have to give a name to your network and choose a security option. The default security option is WPA2-Personal which is stronger. Step 6. You can also leave the security option with no authentication and WEP. Step 7. Do not forget to tick the checkbox with save this network option. 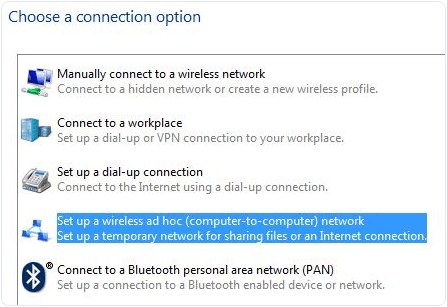 Because If you don’t tick the option then after disconnecting the network you have to configure the network again. Now your wireless network is ready and shown with other networks. Click on your network to connect. After connecting you will see a message at right hand side of network name waiting for users. Then, you have to share data among Wireless Network. If your Laptops have different OS then you have to use the Workgroup sharing option because, this option can share data among similar and different OS. Step 1. 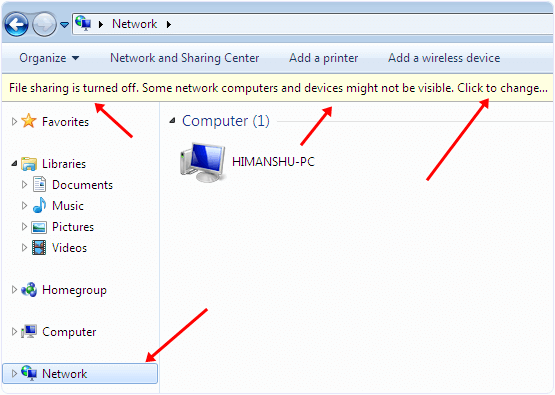 First you need to check adhoc network you created, its network type should be Home or work. Step 2. 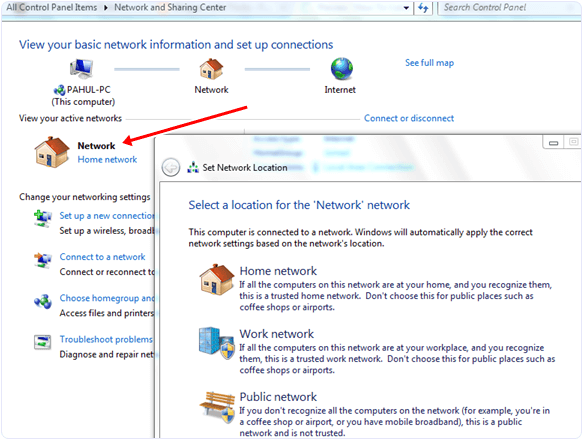 If not then open the network and sharing center then click on the name of network if it says home network then you do not need to change the network type otherwise you have to select home network. Step 3. This setting allow you to share your data with other computers. Other thing you need to check is that all the computers are in the same workgroup. Step 4. In Windows XP you can change Workgroup setting by right clicking on My Computer and select properties. Look for system properties and click on the Computer Name tab to change the settings. Step 5. In Windows Vista and higher versions right click on computer and click on properties. You can change this settings in Computer name, Domain name and workgroup settings section. Step 6. Last thing that we should apply to Windows 7 PC from which we want to access other computer is to open the Explorer and click on the Network option. Step 7. 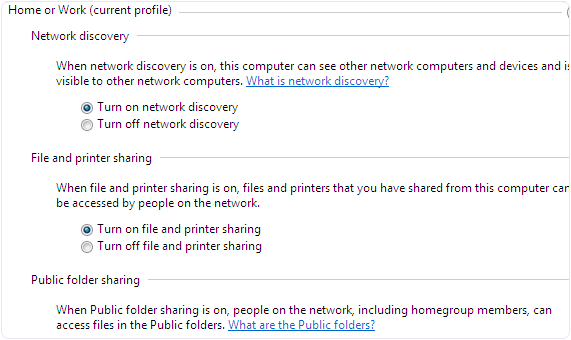 After that you see a popup bar with Network discovery and file sharing are turn off. Network computers and devices are not visible. Turn on this settings to allow sharing of resources. Step 8. 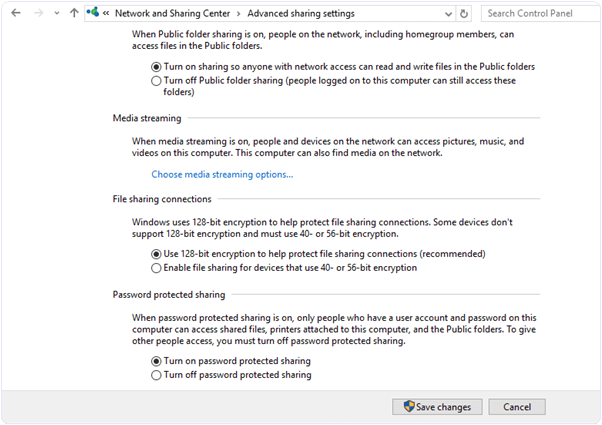 Now open the network and sharing center click on change advanced sharing option. Then tick the radio buttons shown in the images. So these are few steps to connect two laptops using WiFi. By doing these you can easily transfer data from one laptop to another via WiFi. You just need to share that file or folder on network which we had created between laptops. For any assistance, feel free to write to us in comments below.